What is this card about? The Freedom Gold Card is a merchandise catalog card that is issued by Horizon Card Services. After reading this review, you will come to realize that it has essentially identical features as the Horizon Gold Card and the Net First Platinum (which is also issued by Horizon Card Services). 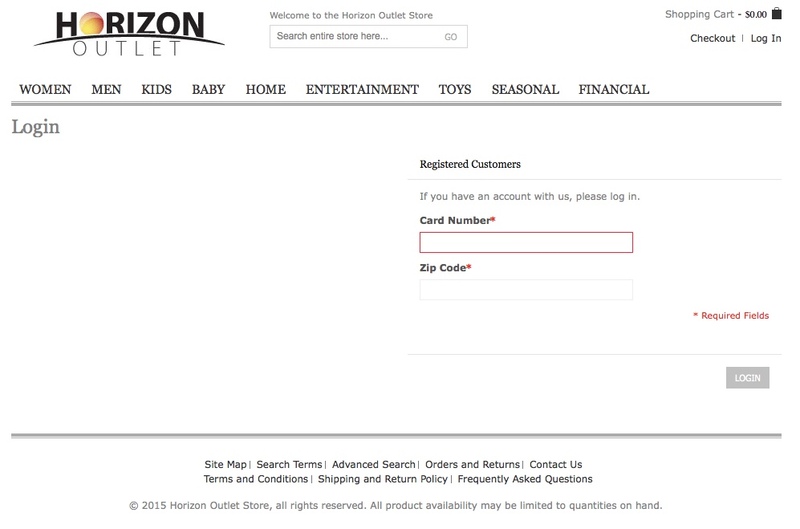 The online store that you can shop if you are a member is ww.thehorizonoutlet.com (you can see a screen shot of it below). One of my peeves of this site is that they only members to see what products are available. The key selling points for this merchandise card is that they perform no credit checks, do not charge any interest rate for purchases (i.e. 0%) and they report to "one major credit bureau". The downside to this card is that you have to pay a monthly membership fee and you can only use this card at their online store. You might have stumbled upon here because you have gotten mails from them. I suggest you continue to read this review before you pull the trigger. APR : 0% - You do not have to pay any interest on balances that you carry. There is a minimum payment which you should be aware of (see next point). Minimum Payment : Your minimum monthly payment will be the higher of 10% of outstanding balance or $25. Depending on how much you buy, you may end up paying off your balance in just a couple of months. Monthly Membership Fee - While you do not have to pay any interest on your purchases if you decide to finance, you will have to be a participating member. And this cost $24.95 a month. I guess it is kind of like the online version of Costco (though I doubt you really save any money). Once you are approved for the card, you will be automatically enrolled in a "monthly membership benefit plan". This includes a $500 Unsecured card, access to My Privacy Protection, My Universal RX, My Roadside Protect and My Legal Assistance benefits. The $24.95 benefits plan membership fee will be auto-debited monthly and will show on your bank statement as Horizon Card Services. Credit Bureau Reporting : Freedom Gold says on it's application form that they report to "one major bureau". Like the Horizon Gold, we think that it appears to be TransUnion. First off, if you look at all the merchandise catalog cards in the table above, many of them actually are issued by the same company and have identical fees and online stores. So let's get this out of the way first. Freedom Gold is issued by Horizon Card Services. So is Horizon Gold and Net First Platinum. Unique Platinum, Next Millennium and Vast Platinum are all issued by Unique Card Services. Fingerhut and Gettington are from Bluestem Brands. Freedom Gold (like all the other Horizon issued cards) offer 0% APR, no credit checks, credit reporting to one bureau (which we think is TransUnion) and a $500 unsecured credit line for the price of a $24.95 monthly membership fees. The cards from Unique Card Services also offer 0% APR, no credit checks and a $1,000 unsecured credit line for a $19.95 monthly membership fee. Nowhere on their site do they mention credit bureau reporting so we are unsure about this at the moment. So compared to the offers from Unique Card Services, the Gold Freedom has a higher monthly fee ($24.95 vs $19.95) and a lower credit line ($500 vs $1,000). However, your credit lines will be reported to one credit bureau. In contrast, both Fingerhut and Gettington do not offer 0% APR, does credit checks. But you do not have to pay any membership fees and they report to all three bureaus. For rebuilders, the most important thing is to get a couple of credit lines, have a credit utilization of only 10% or so, and minimize the fees you pay for your credit lines. As a big picture strategy, you should aim to get a secured credit card that will approve you even if your credit is really bad or if you have just emerged from BK. We would suggest you consider a card like Primor, which is known for their customer services and accepting folks who have been rejected from cards like the Capital One Secured! After six months, you should be ready to get an unsecured card like Credit One. Once you have reached this stage, it is worth adding a couple of other credit lines your mix. And merchandise shopping credit cards can add value from this perspective. The key is to avoid paying additional fees. If you add another subprime Visa or MasterCard, you will end up paying more fees. And it is precisely because of the membership fees that we hesitate to recommend the Freedom Gold card. $24.95 a month works out to $299.40. That is nearly $300 a year. This is really insane. In fact, the Fingerhut and Gettington are ideal because there are no membership fees and they report to all three credit bureaus. There are also much better credit cards for bad credit out there.